We have previously discussed Temporal Mandibular Joint (TMJ) Pain and Dysfunction in more detail (click here for previous article). In this article, we want to review some acute care procedures you can do at home to help care for this problem. First, lets remind ourselves how to accurately feel where your TMJ is on our skull. If you place your hands on the side of your face, just in front of your ear, your hand should be right over your TMJ (see diagram below). To test if you are on the right spot, slowly open and close your mouth. You should feel your mandible move downwards and you may feel a slight gapping at the joint. If your joint clicks or pops out on oneside like mine, you will feel more movement. Next, let us feel for our masseter and temporalis muscles. If you slide your hands slightly lower than the TMJ you should be on the masseter muscle. You can check this by clenching your teeth together. This causes the masseter muscle to contract and your fingers will pop out or move with the contraction. The masseter works with the temporalis muscle to close the mouth. There are other muscles involved in opening and closing the jaw, but to keep it simple, we will only discuss self care for the masseter and temporalis. 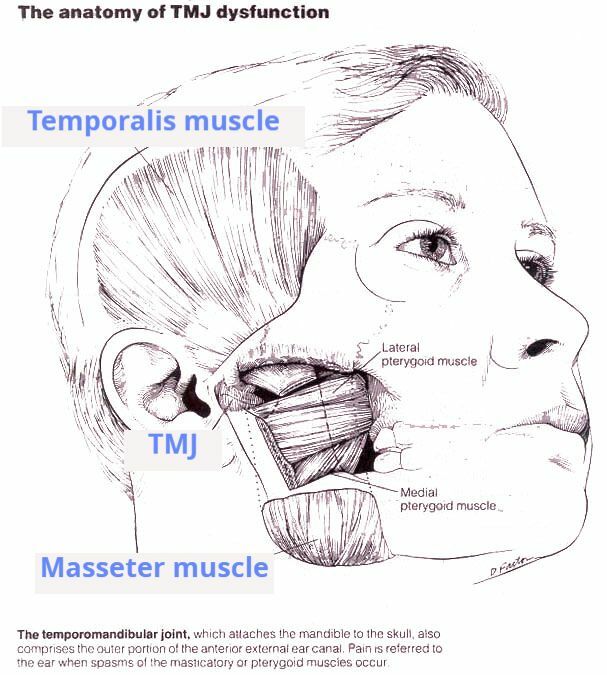 To find the temporalis, move your hands above the TMJ. To accurately feel this broad, flat muscle, you often need to clench your teeth. As you clench, the muscle should contract and pop out a bit. This is the temporalis muscle. At rest, your tongue should be placed behind your front teeth and your teeth should be slightly separated and lips closed. Is yours? If your tongue is not rested in this position, one or more muscles around the TMJ, tongue or neck may be too tight. If you are experiencing pain or tension around the face, neck or TMJ you may be clenching your teeth resulting in uneven forces acting on the jaw. Self treatment may consist of : self massage, ice, heat, pain medication, use of a mouth appliance or the application of various pain creams or medications. Now that you know how to accurately feel for the anatomical structures that are involved in the function of the TMJ, you can apply some self massage techniques. Try taking a slight downward tension on the masseter muscles and slowly open your mouth. Repeat this a few times to your comfort level. The same treatment can be applied to the temporalis muscle but this time take an upward tension on the temporalis. Slowly open your mouth as the muscle glides under your fingers. Repeat again, to your comfort level. If you notice any swelling or the pain becomes intense at the TMJ try applying some cold, in the form of either ice or a cold gel pack (if using actual ice, make sure there is a layer of cloth between your skin and the ice). Apply cold therapy for 15min, off for 30min and then repeat 2 or 3 times. There are some exercises that can assist with improving proper TMJ biomechanics. Practice keeping your tongue on the roof of your mouth or just behind your front teeth, lips together, teeth slightly apart. This is the normal resting position. Maintain adequate head posture: avoid forward head posture, which causes increased upper cervical spine extension and stresses muscles in the front of your neck and jaw that open the jaw. Practice gentle isometrics by resisting jaw motion. Using your hand on the side of your jaw, push your jaw into your hand without letting your jaw move. Do the same with opening your jaw but placing your hand under your chin. To resist closing, place one or two fingers on your lower teeth and try to close against resistance. The key to isometrics is to activate the muscles that would be involved in doing the motion, but not allowing any motion to occur. If you are experiencing any TMJ or jaw pain, speak to your healthcare provider regarding care. This could be your dentist, family doctor, massage therapist, chiropractor or physiotherapist. And remember that often more than one healthcare provider needs to be involved in treating TMJ issues. Both Jen Fleming, RMT and myself, Dr. Marnie D'Andrea, have extensive knowledge and experience in treating TMJ related pain. Please contact us if you have any questions.